Some lessons aren’t easily forgotten. This is one. One fine fall day, a friend and I were fishing for largemouth bass on a small lake—fishing as opposed to catching. After four hours, having tried nearly every bass lure in our tackle boxes, we hadn’t caught a fish. Soon we came upon several anglers in johnboats fishing the edge of a big willow thicket. They were using long jigging poles to maneuver tiny jigs into pockets of water in the brush. He needn’t have asked. I already was rigging a 1/32-ounce jig on a long pole and was looking for an opening we could fish. When crappie are in willow stands, you have to move in with them to do any good. So we grabbed limbs, ducked our heads and pulled the boat into the jungle. I jockeyed the long pole through the thicket and let the jig fall by a half-submerged log. With the bad luck we’d been having, I didn’t expect to catch anything, but I immediately felt a hard strike. This ol’ crappie ought to turn some heads back at the dock, I thought. But it wasn’t a crappie. It was a 3-pound largemouth. Lew caught the next fish, a crappie. The bass was just a fluke, we figured. But the next fish and the next and the next, too, were bass. In fact, more than half the fish we caught were largemouths. We landed none larger than the first, but we hooked and lost some lunkers. Since that day, I’ve caught lots of largemouths and spotted bass while using mini-baits such as panfish jigs. Experience has shown there are times when jigging poles, light rods and reels, light line and mini-lures are more than just panfishing play-toys. Sometimes they’re also the best medicine for cagey bass. Unfortunately, fishing with light tackle and mini-lures also imposes a greater risk of losing a big fish, especially in heavy cover. But you can argue—and I will—that without light tackle, you might not have hooked that lunker to begin with. Furthermore, your chance of landing a big bass on a small lure might be better than you think. One November afternoon, I finished work early in the park where I worked. Local anglers were catching some nice crappie on the park’s small fishing lake, so I grabbed an ultralight spinning outfit and hopped in a boat. Crappie were biting all right. I quickly caught several using a 1/8-ounce Luhr-Jensen Shyster, a small spinner. A swirl near the bank caught my eye, and I fired a cast that way. The lure barely moved when there came a jarring strike. I knew I had hooked a good fish—a bass, maybe, or a nice catfish—and because the fish was obviously strong enough to break the 6-pound line I was using, I played it on a light drag. The fish made several exciting runs, but I finally landed the 8-pound, 15-ounce largemouth. It’s the biggest bass I’ve caught in Arkansas, and I caught it on panfishing tackle. Mini-baits and light tackle are legitimate tools for serious bass anglers. Bassing with such gear is pure fun, too. Nothing you can use will outfish small lures for sheer numbers of bass or eclipse the sheer joy of catching largemouths. Small rod-and-reel combos allow anglers to place mini-lures in tight places without those maddening nuisances called “professional overruns.” Few fishermen can toss lures very far beneath a pier or dock without slight backlashes from a level-wind reel. As a result, most baitcasters fish the edges of such structures, catching a few fish but leaving many lurking in the darkness. The practiced light-tackle angler, however, easily flips small lures into often neglected corners. His tiny artificials are about the size of natural forage and likely to elicit more strikes than larger lures thrown off the mark. Another common situation where small lures and light tackle yield big payoffs is when the water is extremely clear or calm. If you’re throwing big lures under these conditions, you might as well be chunking bricks. This spooks fish, and if you don’t believe it, try this. Fish a stretch of bank with a big lure, then fish a similar stretch—or even the same one—with smaller lures that make a quiet touchdown. 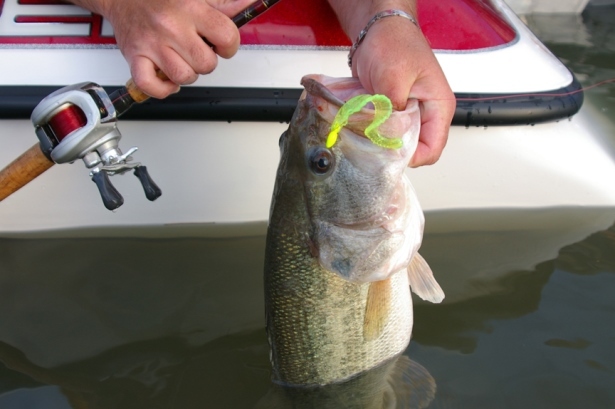 You’ll find light line and mini-lures are less intimidating to bass, thus increasing your catch. The small spinners often used by panfish anglers also are effective bass-catchers. These include some of my favorites like the Mepps Aglia, the Panther Martin Spinner, Worden’s Rooster Tail and the Luhr Jensen Shyster. Fish them around open-water structures—bridge pilings, riprap, rock outcroppings, etc.—to avoid snagging the treble hooks. Small crankbaits also work wonders on persnickety bass. Many models are available, but I’m partial to those in Rebel Lures’ line, which have proven to be great bass-catchers for me. These include the 1-3/4-inch Rebel Humpback, the 2-inch Wee-R, the 1-1/2-inch Teeny Wee-Crawfish, the 1-1/2-inch Teeny Wee Frog, and a variety of mini bug-imitators such as the Bumble Bug, Big Ant, Crickhopper, Hellgrammite and Cat’r Crawler. A back-pocket-size tacklebox is big enough to hold all these lures in a variety of colors, and because this collection allows fishing from the surface to the bottom, it’s hard to beat. If you give some of these mini-lures a try and hook a big bass as a result, there’s no need to kiss your fish goodbye. Keep your cool, don’t rush, and apply steady pressure against a properly adjusted drag. You’ll be surprised how quickly bass yield to light gear. Yes, some big fish you hook will break off or twist free. But you’ll catch a surprising number of them, and you’ll understand what fishing mini-lures is all about—putting fish on the dry side of a boat when nothing else will produce. Beware, though. After you’ve tried fishing with mini-lures, you may find yourself coming back to them again and again. Catching bass on light tackle compounds the thrills, challenges your angling abilities and is unadulterated fun. It is, in a word, addictive. Looking for fishing shows on Outdoor Channel during the months of October – December? “The Hunt for Big Fish”and “Stihl’s Reel in the Outdoors” both air in the last quarter of the year. Check the schedule forupdated air times.